Shegogue Brew: New Brew Assistant in the Making! New Brew Assistant in the Making! 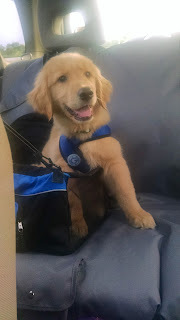 I have been rather MIA from my brew hobby due to a new member of the family - Our golden retriever puppy, Avery! 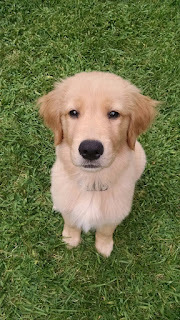 My wife grew up with many dogs, but her (still lived with her parents) golden retriever passed away last year. After a grieving period we decided we wanted a new dog of our own. We went back to the breeder my wife's family had gotten all their golden's from and had to wait almost a year for a pup. Avery is 11 weeks old tomorrow and is adjusting very well to his new home. I haven't introduced him to the brewery yet, but once he shows a little more restraint in other areas of the house he will become my brewing assistant! Prior to getting Avery I was able to make my first, and sad to say only, batch on the new system. It was a session IPA using Cascade, Simcoe, Centennial and Citra hops - so you know its delicious. I hope to provide a recipe update post with tasting notes and obligatory pictures soon. Stay tuned! Until then, Avery says "Relax, don't worry, and have a homebrew!"